The bag of clubs standing on the fence has been designed and reproduced in minute detail by artisan craftsman Mark Elliott. His attention to detail is such that even the golf bag zips can be seen and all the clubs are grooved and are the correct shape. 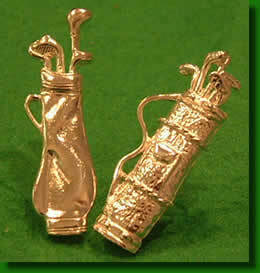 The clubs are removable so as display can be made to suit the mood of every individual. 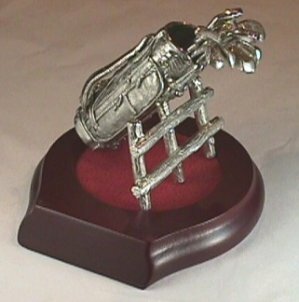 Each piece can have an engraved plaque with your personal message indicating that special day, birthday, corporate day out, retirement, best golfer etc. A certificate personally signed by Mark Elliott will accompany each piece. Golf bag with full set of clubs consisting of Driver, 3 wood, 5 wood, 3,4,5,6,7,8,9 iron, pitching wedge, sand iron and putter leaning against a fence. 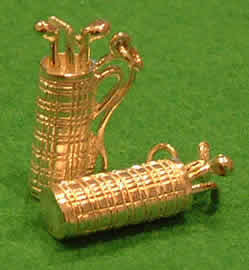 Golf tie tacs, stick pins and cuff links. All items will be hallmarked. Every golfer uses them so why not have yours personalised ? Golf ball marker personalised with the initials of your choice. Engraved message of your choice. For all your competitions, events etc. 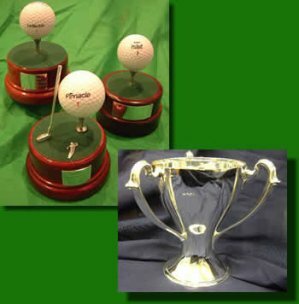 Trophies and Cups can be made to your specifications. Email custom@uniquegifts.co.uk for a quote. Longest Drive Award / Nearest The Pin. Celebrate your achievement with this hand-crafted award. 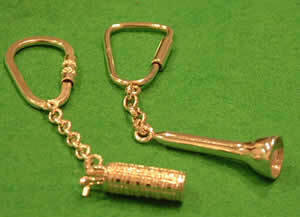 Available with wood or iron.